Pat roast dry and season with salt and pepper. 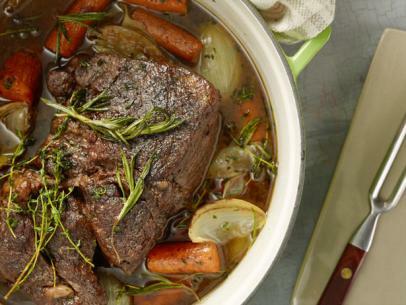 In a Dutch oven, heat the vegetable oil over moderately high heat until hot but not smoking. Add the roast and brown on all sides, about 15 minutes total. 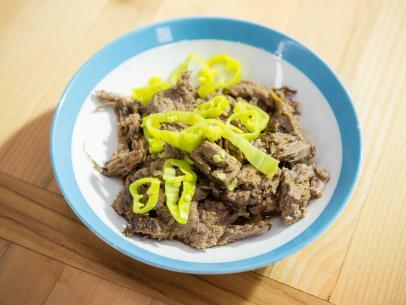 Transfer the roast to a plate and pour out all but 1 tablespoon of fat from the pan. Add the onions, carrots, and celery to the pan and cook over moderate heat, stirring until golden. Place the roast back in the pan along with the bay leaves, thyme, and enough of the beef stock to come up 2/3 of the way up the beef. 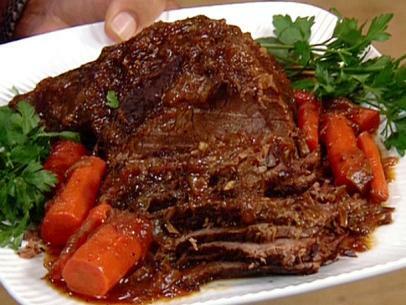 Bring the pot roast to a simmer on top of the stove, skim, cover tightly, and set in the lower third of a 350 degree preheated oven. 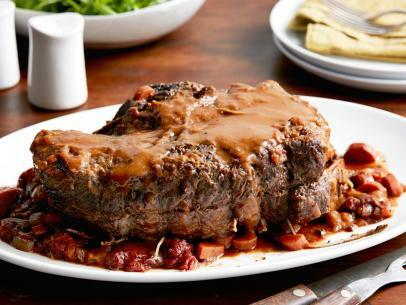 Regulate heat so that the liquid remains at a gentle simmer for 2 1/2 to 3 hours, until the beef is tender. 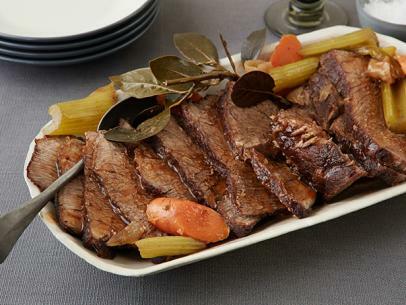 Turn the roast over several times during its braising. 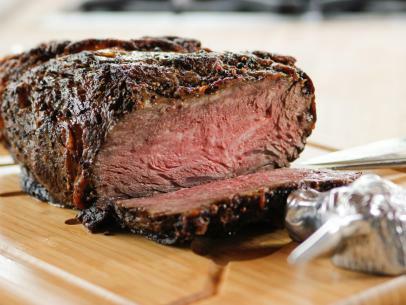 Transfer roast to a cutting board and let stand 10 minutes, covered with aluminum foil to keep warm. Skim off any fat from the surface of the liquid. Strain the liquid. To thicken the sauce slightly, bring the liquid to a boil. For each cup of liquid, stir together 1 tablespoon butter and 1 tablespoon flour. Whisk the butter mixture into the liquid. Simmer, stirring constantly, until thickened. 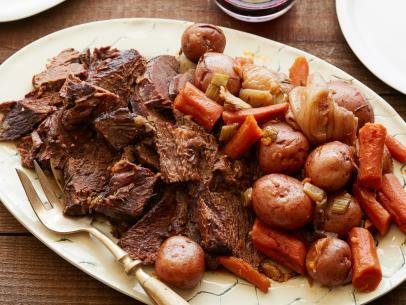 Slice the pot roast and serve with the sauce and boiled new potatoes.